Whoa, now here’s news! 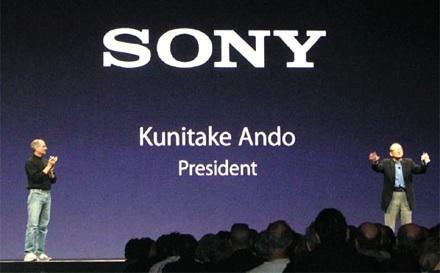 Reuters are reporting that Apple has Sony in its sights and are looking to buy the faltering Japanese giant. If true, it’ll be sign of a concerted push by Apple into the homes of us all, and signals that the next great tech battle will be fought around the smart TV. With Apple TV not really selling well and now facing new competition from Google TV (which, incidentally, Sony is one of the loudest supported of, and has released the first HDTV with Google TV built-in), buying Sony would give the company an instant leg-up in the home entertainment market. It would also mean Apple could integrate the iPhone with the PSP (something that Sony Ericsson are rumoured to be doing with their next Android phone) and turn Sony’s entire Hi-Fi line directly towards the iPod and iTunes. Although Apple have obviously denied any of this, the rumours have sent Sony’s shares up by 3%. Apple are sitting on a $51 billion pile of cash, and Steve Jobs has been quoted as saying “…we do feel that there are one or more strategic opportunities in the future,” with Sony, Adobe and Disney all being identified as potential targets. Of the three, Sony makes the most sense. There can be no love lost between Apple and Adobe, with Jobs laying into Adobe’s Flash and refusing to support it on either the iPhone or the iPad, and no real need for the company to buy it. Disney would move Apple into a distinctly different market, although with Pixar under the Disney banner, there’s an obvious affinity and history there. But it’s with Sony that any deal makes the most sense, simply because its brand, its range of home entertainment gadgets, and the brains of its staff, would all perfectly align with Apple. Apple takes on Sony with Wi-Fi TV.